Too many hard-working Americans and small businesses are finding it impossible to get health insurance that meets their needs and their budgets. Premiums and deductibles are sky high. Many who once could afford to buy coverage in the small group and individual markets no longer can. Average premiums for individual health insurance rose 105% in the first four years after Obamacare took effect — from $232 to $476 a month on average — and, not surprisingly, the number of people with individual policies continues to fall. Fewer people had individual policies in December 2017 than in December 2014 — the first year in which Obamacare took full effect. And the number of small firms offering health benefits to their workers dropped by 24% between 2012 and 2016.Obamacare is a key driver of these problems because it forces people to pay more for policies that restrict, rather than expand, their access to care. Networks are narrower, deductibles and copays can be prohibitively expensive, and access to doctors and hospitals is limited. Half of those buying coverage in the Obamacare exchanges have a “choice” of only one insurer. Still, government spending is soaring. It’s time that Congress provided relief from Obamacare’s higher costs and reduced choices. Americans need insurance that will give them financial security and peace of mind. We need a solution that will protect the sick without burdening the healthy and driving them out of the insurance market. Work has begun in the states and in Washington to advance these goals. States are seeking federal waivers from Obamacare rules to the fullest extent possible. The Trump administration is using its regulatory authority to give people more affordable choices, including allowing small businesses and individually-insured people the ability to join larger insurance pools to get better rates and more flexible benefits. It also is reviving short-term limited-duration policies, which will offer millions of Americans a bridge to retaining coverage and to purchase policies free of the expensive and burdensome Obamacare requirements. Congress also has taken several important steps by repealing the individual mandate’s tax penalty starting in 2019, ending the dreaded Independent Payment Advisory Board, and delaying some Obamacare taxes. This step-by-step relief is important, but it is not enough. These actions do not repair the fundamental damage that Obamacare is doing to private health insurance markets. For that, Congress must act. After efforts to repeal and replace Obamacare fell short last year, many in Congress seem resigned to accepting the status quo or even willing to bail out and prop up the program. But Obamacare is broken, can’t be fixed, and continues to do great harm. What’s needed is a fresh approach — one that gives Americans more choices of private, affordable coverage while making sure the most vulnerable are protected. Ensure people can opt into the private coverage of their choice. Empower consumers with more choices. Under Obamacare, consumers lost choices because the federal government set overly strict rules for insurance. Consumers bear the consequences: higher premiums, higher deductibles, and fewer choices of insurance plans and providers. Real reform would put patients first. Choice is essential for high-quality health care to flourish. Washington has shown it is inept in managing something as complex as local health insurance markets. Instead, we need state-based solutions. Our proposal would replace open-ended federal payments to insurance companies with grants to states, so they have resources as well as more flexibility to reinvigorate broken private individual and small group markets. This approach would empower patients, lower premiums, increase choices, and protect the vulnerable. Reduce costs by unwinding heavy federal mandates and allowing states to innovate. Obamacare’s mandates and pricing restrictions drive up costs and restrict choices, crushing the market. Insurance companies are fleeing the Obamacare exchanges, and many that remain in the heavily bureaucratic exchanges are charging exorbitant rates. Obamacare’s red tape has left states powerless to address these problems. Our proposal will empower people to access health insurance that is more affordable and widely available. States will have the resources to create innovative solutions and encourage more competition among insurers on choice and costs. Plans could offer discounts to people who are continuously covered, for example, and young people who are being driven away by Obamacare’s punitive rules and high premiums could get special discounts to encourage them to get covered. Refocus subsidies on those who need them most. Americans need to know they can find private insurance they can afford so they can protect their families and will have financial security, even if they get sick. Direct block grants to the states would enable states to better target assistance to those in need. Provide security and protect high-cost patients. Today, Obamacare’s subsidies provide coverage for the vulnerable but increase costs for everyone else. In contrast, our policy proposal would help people who need assistance in getting coverage, as well as dedicate a portion of the grant to offset the costs of the most-expensive patients, reducing premiums for everyone else. Ensure that all Americans can choose a private health plan. Obamacare locked millions of people into government-run Medicaid programs, which often provide lower quality care and severely limit access to physicians, particularly specialists. Our policy proposal would give them the option of using these support dollars to buy into private coverage. Protect life. Funding for these grants to the states would run through the existing Children’s Health Insurance Program. Life protections are written into the CHIP statute, permanently prohibiting federal taxpayer dollars from being used to pay for abortions. Put federal spending on a real budget. With its open-ended subsidies to insurance companies, federal spending rises dollar-for-dollar with premium increases. Real reform will provide fixed grants to states and give them greater flexibility to reinvigorate private markets that have been broken by Obamacare. By putting spending on a budget, states — which are better equipped to innovate and meet the unique needs of their residents — would have new incentives to ensure that taxpayer dollars are used wisely. The federal government would provide a fixed amount of funding to each state. Instead of sending tens of billions of dollars every year to insurance companies, Washington would issue grants to states. Initially, the grants would be based on the amount of ACA spending as of a fixed date. Over time, the grant would be based on a state’s number of low-income residents. States would use the money to help vulnerable citizens obtain coverage. Reduce premiums by reinvigorating broken, private health insurance markets that tried and failed to fit into Obamacare’s one-size-fits-all structure. They also would have resources to help high-cost patients through risk pools, reinsurance, and other risk mitigation protections. Individuals and families would choose the coverage that best meets their needs. Obamacare put bureaucrats first and consumers last. Our consumer-centric approach will help health insurance markets heal from the damage Obamacare has done and give Americans more freedom and choices. Give low-income people more choices. Instead of being able to enroll only in public programs, recipients would be empowered to use their government assistance to buy a private health plan of their choice. This requirement for states to offer “premium assistance” also would apply in other federal programs, such as Medicaid and the Children’s Health Insurance Program. Individuals receiving subsidies also could have the ability to choose health sharing ministries, direct primary care, employer-sponsored care, and other options they prefer. Leverage sensible approaches to protect people with pre-existing conditions without making coverage so costly for the young and healthy. States would no longer be bound by Obamacare’s mandates such as essential health benefits, minimum loss ratio requirements, single risk pools, and 3:1 age rating requirements. Instead of having to comply with heavy mandates that dictate what insurance should look like, states could give citizens a broader choice of plans. And states will have resources to help people with more expensive conditions access coverage without driving up costs for everyone. States would have better incentives to protect the most vulnerableinstead of chasing federal Medicaid expansion dollars to add new enrollees while neglecting those already on the program and in need. With the federal entitlement to premium subsidies and Medicaid expansion repealed, states would be free to design their own assistance programs to make sure those who most need help receive it. Remove restrictions on insurers’ ability to use innovative approaches to encourage wider coverage. For example, insurers would be able to offer discounts to people who are continuously covered and to provide “Youth Outreach Discounts” to young adults so they are not forced to pay unfairly high premiums. Spend grant money only on health care. The federal government won’t micromanage the states, but it will hold them accountable. States would be required to spend their federal grants on making health coverage more affordable and widely available — not for other purposes. Life is protected. The grant would be distributed through the Children’s Health Insurance Program which provides protections against taxpayer money being used to fund abortions. Obamacare requirements on essential health benefits, single risk pools, minimum loss ratio requirements, and the 3:1 age ratio would not apply in states receiving federal allotments. Nullifying these mandates along with new flexibility to the states would reduce premiums, allow fairer premium variation and, in combination with risk mitigation, assure that the sick get the coverage they need without charging the healthy unfairly high premiums. Funds to finance the block grants would be based upon spending, as of a fixed date, on ACA subsidies (both tax credits and CSR payments) and Medicaid expansion. Greater Access to HSAs: Consumer-centered health reform doesn’t stop with a new grant program for the vulnerable. It also enhances choice through such tools as Health Savings Accounts, which allow people to pay for medical care — tax free — and save for future heath care expenses. More than 22 million people use these accounts, but today few people can find an Obamacare plan that allows them to have an HSA. Our policy proposal would take two key steps to improve HSAs so they can be more flexible, more widely available, and give consumers greater control over how their HSA dollars are spent, including seeing the doctor of their choice. First, the proposal would roughly double HSA contribution limits. Today annual HSA contributions are limited to $3,450 for an individual and $6,850 for a family. These limits aren’t keeping pace with rising deductibles and catastrophic protections. The average deductible for family coverage under a Bronze plan is over $12,000. The average out-of-pocket maximum for such policies is nearly $14,000. Second, the proposal would make more plans HSA-compatible. Today, in order to be HSA-compatible, a policy must have a deductible of at least $1,350 ($2,700 for families). The average Obamacare Silver plan had a deductible of $4,033 ($8,292 for families). In 2016, more than four of every five plans on the federal exchange had deductibles greater than the legal minimum for HSAs, but less than a fifth were HSA-eligible. This proposal would change the requirement to qualify, so that any plan with an actuarial value less than a specified level (e.g., 70%, 80%) could be HSA-compatible. Americans have heard many promises from Washington, but Washington has shown it cannot deliver. It can’t fix the problems it has created. We need consumer-centered state and local solutions that put consumers first and restore personal freedom. People of many political persuasions agree on the broad goals of reform in providing access to coverage, making care and coverage affordable, guarding the quality of care, and providing a choice of physicians, treatments, and insurers while, importantly, protecting the most vulnerable. Government that is closer to the people, released from Obamacare’s dominance, can offer innovative solutions to help Americans gain insurance protection and greater security to take care of their families now and in the future. A truly competitive market that is responsive to patients can provide more choices of more affordable health insurance and better access to care, while encouraging innovative solutions in medical care and care delivery. The federal government is getting in the way of these advances. Much more needs to be done to modernize our entitlement programs to make them more efficient, transparent, and to make programs responsive to consumers instead of bureaucrats and special interests. The proposal described above does not fix everything that is wrong with our health sector today, but it is the logical next step in helping our private health sector recover from Washington’s failed approach. Top-down, Washington control clearly doesn’t work. States can be much more responsive and flexible in meeting the needs of their citizens. The goal is to empower consumers to have the choices and control they need to protect themselves and their families. 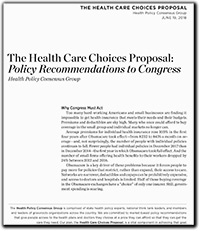 The Health Policy Consensus Group is offering recommendations for terms and conditions of block grants to the states in order to lower costs and increase choices in health care. We hope that our policy guidance will be of assistance to legislators. Any legislation that may be developed based upon a block grant approach to health reform will by necessity include an allocation formula and may include additional policy provisions. Our group, however, focused our recommendations on the terms and conditions of block grants, not these other issues. *Affiliations listed for identification purposes only.